Thirty years after vanishing from the Midwest, peregrine falcons are thriving in smokestacks, skyscrapers and cliffs. The population has not only rebounded but quadrupled from its pre-DDT numbers. Pesticides, mostly DDT, destroyed peregrine falcon populations in the 1950s and 1960s. The DDT caused thin, easily broken eggs. 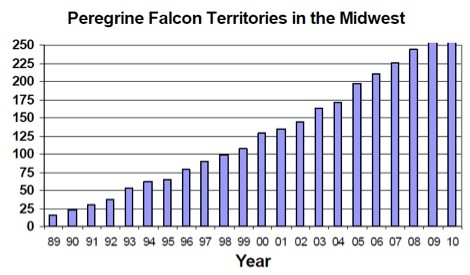 Redig said 1962 was the first year there were officially no peregrine falcons in the Midwest. The birds became a federally endangered species in 1970. DDT was banned in the U.S. in 1973. But in 1982, Redig and ecologist Bud Tordoff started releasing peregrine falcons in the sand dunes of Wabasha, Minn. They continued the practice for about five years. Some breeding pairs would return to nest. But there was a problem. “The birds nesting on the cliffs were just slaughtered by great horned owls,” Redig said. And then the two men had an idea not typical of wildlife reintroduction — head to the city. Peregrine falcons historically lived on rock cliff ledges. With their height and concrete, bridges, buildings and smokestacks have similar features. Redig and Tordoff started releasing birds at the City Center Building in downtown Minneapolis. And the plan worked. By 1990, there were nesting pairs all over the Great Lakes region, Redig said. 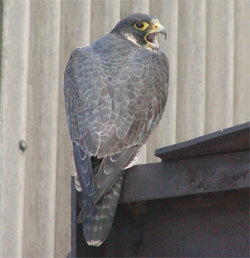 Peregrine falcons were soon living in Chicago, Milwaukee and Indianapolis. Non-urban birds became increasingly adept at better protecting young from killer owls. Not only have the birds rebounded but there are now more birds than ever. And they’re living in places they never were. And while the Upper Peninsula population has bounced back, there are also peregrine falcons in the Lower Peninsula, Rustem said. The Detroit area alone has about 17 breeding pairs, according to the EPA. Prior to the population crash, Indiana had about three nests in the entire state, said John Castrale, a nongame bird biologist with the Indiana Department of Natural Resources. Ohio is another state that the birds did not historically nest in. The state now has 43 nesting sites — every one of them urban, according to the Ohio Department of Natural Resources. Some states – Pennsylvania, Ohio, Wisconsin – have live cameras where people can observe the birds online. Peregrine falcons were removed from the federal endangered species list in 1999, but remain endangered under state laws in Michigan, Wisconsin, Indiana, Pennsylvania and New York. The birds have threatened status in Minnesota, Illinois and Ohio. The Midwest Peregrine Restoration Project released about 100 breeding pairs a year until the mid-1990s. The population is so stable that the project now focuses mostly on monitoring, Redig said. There is one challenge — the birds have become city slickers. Redig said one goal is to “get the birds off welfare.” The project discourages people from aiding new birds trying to nest on their buildings. The thriving peregrine falcons are a testament to determined restoration efforts. For Redig, who has made a career out of it, the birds are well worth the effort. “They’re just such a highly evolved bird,” he said. “When a peregrine dives down at over 200 miles an hour for prey, or a group brings an entire cliff to life, it’s just beautiful. Peregrine Falcons are amazing birds. I just wish that we could train them to eat more common species, instead of Woodcock, Cuckoos, Snipe and other more uncommon birds species. Lansing has a 2 live Webcams connected also. The images update every 15 minutes on the site.. Band records show that 6 peregrine pairs currently nesting in Michighan have one resident adult that is from the southern Ontario Canada area. Ohio has 4 pairs which have one resident adult from the same southern Ontario region. Pennsylvania(1) and New York(3)both have some too. 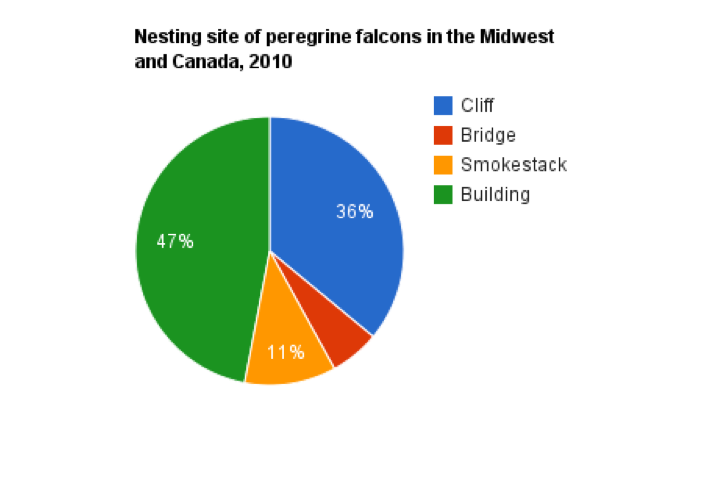 I volunteer with the Canadian Peregrine Foundation and that information is accurate as at the end of 2011. We also have several resident peregrines from Ohio, New York, Pennyslyvania and Ohio nesting in southern Ontario locations.